A Liberal's Libretto: MSNBC's Griffin: Shuster is "not moral, ethical or professional"
MSNBC's Griffin: Shuster is "not moral, ethical or professional"
I ran out of time and missed my window of opportunity to get my tickets to the MET's Dress Rehearsal of Armida. I think it goes without saying, Friendlies, that Yours Truly is a little cranky because of it. I'm sure most of you saw my recent open letter-type post to David Shuster from MSNBC. If you didn't, you cant see it here. Friends, it would seem that not everyone shares my opinion about David Shuster ... cue: gasps, shock and dismay. This morning, Mediaite is reporting in an exclusive, that MSNBC president Phil Griffin has angrily detailed the reason for Shuster’s indefinite suspension. Your “suspension” of David Shuster makes it necessary for me to boycott MSNBC, which is slowly but surely going the way of Fox “News”. I will miss Countdown and parts of Maddow’s show, but I refuse to watch MSNBC ever again. It is a hideous embarrassment and an indictment of your judgment that you have Pat Buchanan on every daytime show and some of your evening programming. It should be noted that this is considered a personal correspondence with Mr. Griffin and I'm sure Mr. Griffin, in responding, had no idea that his response would be published on the internet ... or maybe he did. Sorry, but this is a business and I need team players. He was not moral, ethical or professional and that is not fair to the 500 people who work at msnbc. Something tells me that if there is a blacklist somewhere - David Shuster has just found himself on it. Which, oddly enough, makes him the perfect candidate to go back to his old job at FauxNews. Just to clarify, we have confirmed the email’s authenticity. 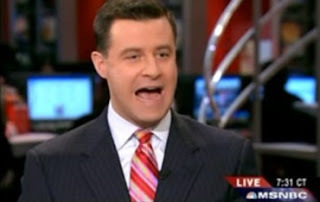 David Shuster is no Olbermann, Shultz, or Maddow wannabe. Unlike any of them, he has serious journalistic cred, which is widely recognized by many MSNBC fans that are deeply concerned about ever thinning team in their newsroom and at their dizzying anchor desks. His Scooter Libby coverage was vital to progressives and second to none. To suggest he doesn't have "grassroots" appeal reveals more about your tastes and lack of understanding of MSNBC's core demographic than it reflects the truth about David Shuster. Think the e-mailer was the only one who feels strongly Griffin is clueless? Think again. For more regarding the comment above, make sure to see my post: David Shuster, your comments and Phil Griffin's rebuttal.